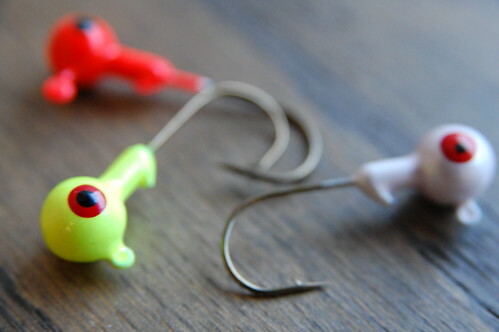 Last year I got Andrew’s dad & grandfather some fishing lure for Christmas. 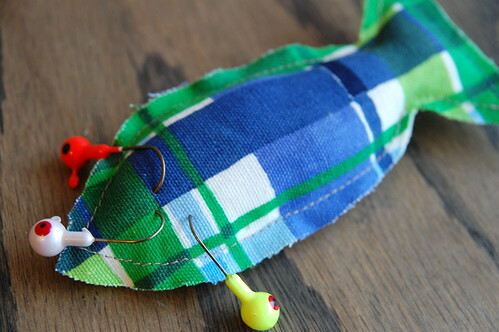 These jigheads have a super sharp hook, so I thought it would be cute to sew up little fabric fish from scraps and safely hook these little guys into them before wrapping them up. It was something I did at the very last minute, but I think it looks so cute! For some other ideas, I thought I would just point you in the direction of my holiday posts from last year, since I can’t really share this year’s ideas just yet. A couple people have mentioned to me that they’ve made some of the French Chocolate Granola for gifts. I personally think food gifts are awesome. This is just the inspiration I need to get going/finishing my gifts – these are fantastic ideas! Thanks Karyn! i sent homemade russian tea cookies and crinkles as presents! it’s my first time giving away food gifts and sending them out as well! i’d love to do patchwork potholders, but bias binding is still not my forte. can’t wait for photos of your ideas! Ps I’m from Australia and the person who recommend me this blog was from a fabric shop in Melbourne Australia, just thought you might want to know how well known you are in other countries. i would love to come to Canada just to visit the workroom, it looks amazing. you should be proud of what you have achieved.